* ... ALLEN ROAD EXTENSION: Not that it's official yet, but I hear the extension of Allen Road from Ming Avenue to White Lane in the Southwest will be opening within a week or so. This will instantly become a heavily traveled road and a much needed short cut for Southwest denizens. Be careful, however, because folks in the Seven Oaks area get on and off the bike trail there so beware of cyclists. The bike path extension now runs under the new Allen Road extension and out to Enos Lane. * ... RUBIO RAKES IT IN: I was over at the new wine bar Imbibe off Truxtun last week and happened upon a Michael Rubio fund raiser. The county Supervisor is running for the State Senate 16th District seat being vacated by Sen. Dean Florez. He's a shoo-in to win it, particularly since former Fresno assemblywoman Sarah Reyes dropped out. Rubio is something to watch in public: smooth, working the room, collecting a ton of money, fluent on all the issues. His war chest is now approaching $400,000, so I doubt he'll have serious opposition. Among those attending were Joe and Mimi Audelo, former city councilman Mark Salvaggio, Joe Drew of Tejon Ranch and his wife Jan (I'm not implying he was there on behalf of Tejon because I don't know), local divorce attorney Karen Gaul, lawyers Tom DeNatale and Jay Rosenlieb, DA candidate Lisa Green and husband Jeff of Grimmway Farms, and a host of others. 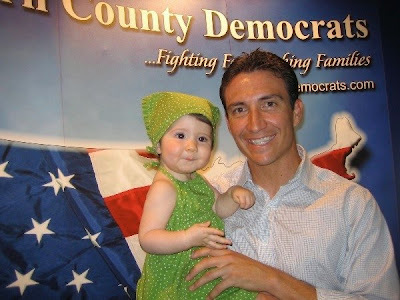 The picture below is of Michael and daughter Iliana. * ... 100 PERCENT PECKERWOOD: Read with interest the story in today's Californian about the Oildale gang terrorizing Hart Park. This appears to be a group of clueless losers from the bowels of Oildale, self-made white supremacists who have nothing better to do on weekends than drive over to Hart Park and prey on Hispanic families enjoying a picnic. And get this: the name of the gang is the Peckerwoods. Now, I'm from Georgia, went to college in South Georgia, and even there Peckerwood is an extremely derogatory term for Southern white trash. And these guys have embraced it? Glad to see the police and DA crackdown on these knuckleheads. * LARRY'S REPLACEMENT: Had a chance to share a glass of wine the other day with outgoing County Schools Superintendent Larry Reider, who is out as of the end of June. He tells me his replacement, Christine Lizardi Frazier, will be an instant hit. She's a 30-year educator who joined the superintendent's office in 1996. She's also done some impressive work in Compton when our Kern County office was down there trying to straighten that mess of a school system out. Looking forward to Ms. Frazier taking the lead. Below is her picture. It's not shoe-in! It's shoo-in! It's not "..cause folks in Seven Oaks..." but "because folks in Seven Oaks"! So noted! You're not my third grade teacher Mrs. Fitzsimmons are you? She used the same tone with me. Indeed, young Richie, it is I, Mrs. Fitzsimmons, in retirement at last, with my red pen at the ready, giving you a C- for correct spelling and usage.